Somehow I got to doing a whole bunch of art shows this fall. We will be kicking things off this Friday, September 25, with two openings for group shows I am participating in, one at Bottega and another at Parallelogram. 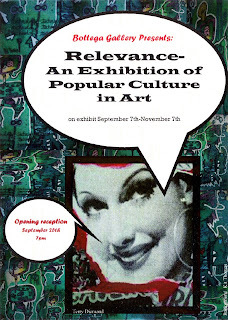 The "Relevance" exhibition at Bottega will feature popular culture in art with a selection of pop art and related pieces from artists Mark Atkins, Terry Diamond, Steven Gibbs, Everett Freyberg, Scott James, Christopher Muniec, Teo Ninkovic, Candy Pegram, Kit Thomas, and Addie Wuensch. Opening reception starts at 7 pm at Bottega Art Bar & Gallery in downtown Wilmington (map). 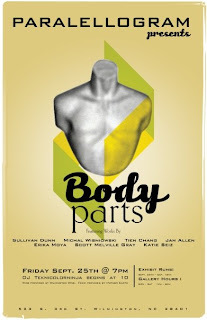 Meanwhile, another opening will be getting on its way, also starting at 7 pm, a little further out at Parallelogram for the exhibition "Body Parts." After visiting Bottega first I will then be joining this event at Castle & 3rd (map). The show includes work from artists Sullivan Dunn, Tien Chang, Jan Allen, Erika Moya, Scott Melville Gray, and Katie Seiz. On top of these shows, I will be sending a few pieces to a group show in Syracuse, NY. 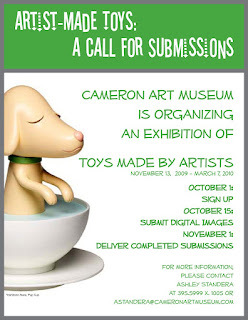 November will be even busier, with both Nikki and I participating in the new toy exhibition at the Cameron Art Musuem. Then, shortly after the toy exhibit, I will be taking [peripheral/interface] to Roanoke, VA for display at the Carless Brit Museum. Finally, holiday group shows are on the horizon for December as well. One will take place at Parallelogram, while the other I am still waiting for confirmation on. How did things get so crazy busy all of a sudden? I have no idea, but I think it's a good sign. Hopefully with all these shows this will also mean that there will be sales. Something which is a rarity for me in Wilmington.